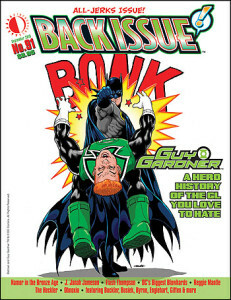 Shipping TODAY: BACK ISSUE #91, an ALL-JERKS ISSUE, starring the Green Lantern you love to hate, Guy Gardner! Plus: Namor in the Bronze Age, J. Jonah Jameson, Flash Thompson, DC’s Biggest Blowhards, the Heckler, Obnoxio the Clown, and Archie’s “pal” Reggie Mantle! 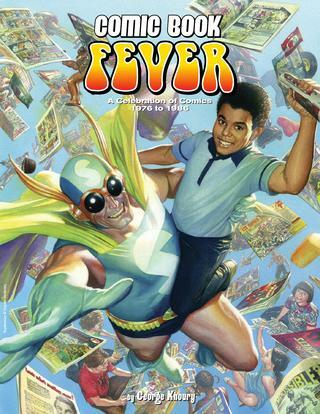 Featuring the work of (non-jerks) RICH BUCKLER, KURT BUSIEK, JOHN BYRNE, STEVE ENGLEHART, KEITH GIFFEN, ALAN KUPPERBERG, JOE STATON, and many more. Cover-featuring KEVIN MAGUIRE’s iconic Batman/Guy Gardner “One Punch”! Edited by Michael Eury. Don’t ask—just BI it! Order HERE! This entry was posted in TNT on 17 August 2016 by Mr. Morrow. 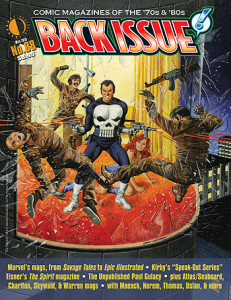 BACK ISSUE #88 sells out shortly after release! More new magazine sell-outs expected! Due to recent changes with our distributors, TwoMorrows is experiencing unprecedented levels of reorder activity on our magazines. Case in point: Back Issue #88, only four months old, is already completely SOLD OUT. Demand was so strong, we couldn’t fill Diamond Comic Distributor’s reorder, so stores are being shorted, leaving customers disappointed. And we anticipate this happening with other issues of all our magazines for the foreseeable future. We base print runs on the INITIAL orders from Diamond’s PREVIEWS catalog, and the number of subscriptions and pre-orders at press time. Second printings are almost never an option, leaving only the digital version for customers who wait too long to order. BOTTOM LINE: We can no longer guarantee copies will be available for long after initial release! Don’t wait for a relisting, convention, or sale, or you may miss out. And if you’ve held off ordering any recent issues, many are close to selling out, so order now! Thanks for your understanding, and for making our magazines the Future of Comics History! This entry was posted in TNT on 15 August 2016 by Mr. Morrow. Half-Price Hardcovers, the next two weekends! MANY of these are nearly SOLD OUT, so get hardcovers for less than a softcover (plus free digital edition where available) while they last! This entry was posted in TNT on 5 August 2016 by Mr. Morrow. Three new mags now shipping from TwoMorrows! Bwah-hah! Draw! 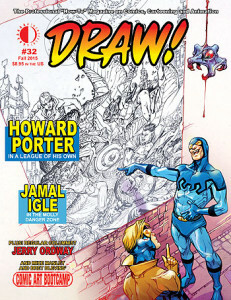 #32 (80 full-color pages, $8.95), yuks it up with super-star penciler Howard Porter (Justice League 3000, Justice League of America, Superman Beyond) as he monologues and demos the creative process that has made him a top-tier penciler for DC Comics. Then we heckle power penciler Jamal Igle (Supergirl, Molly Danger, Zatanna) into spilling his guts about everything from storyboarding to penciling for the big boys, as he gives a breakdown of his working methods. Plus our regular line-up of columnists demonstrate their shtick: Crusty Critic Jamar Nicholas reviewing art supplies, Jerry Ordway showing the Ord-Way of doing comics, and Comic Art Bootcamplessons with Bret Blevins and Draw! editor Mike Manley. No matter how you frame it, this issue kills! 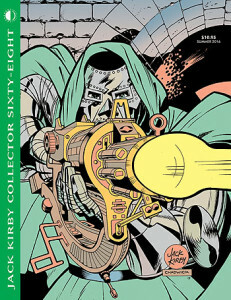 Jack Kirby Collector #68 (100 full-color pages, $10.95) spotlights Key Kirby Characters! In it, we examine pivotal characters Jack created throughout his career (including some that might surprise you)! Plus there’s a look at what would’ve happened if Kirby had never left Marvel Comics for DC, the 2015 Kirby Tribute Panel from WonderCon (featuring Neal Adams, Darwyn Cooke, Fred Van Lente, Crystal Skillman, and Len Wein), Mark Evanier and other regular columnists, and galleries of rare and unseen Kirby pencil art! All behind a recently-discovered 1960s Kirby illo of Dr. Doom, newly inked by Concrete’s Paul Chadwick! Edited by John Morrow. 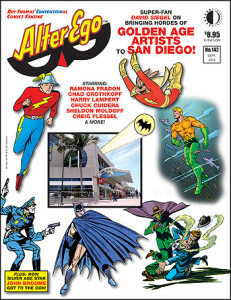 In Alter Ego #142 (80 full-color pages, $8.95), super-fan David Siegel talks to Richard Arndt about how, from 1991 to 2005, he tracked down some of the greatest and hardest-to-find artists of the Golden Age and brought them to the San Diego Comic-Con! Featuring art and artifacts by those classic talents, including Ramona Fradon, Chad Grothkopf, Sheldon Moldoff, Harry Lampert, Chuck Cuidera, Creig Flessel, Paul Norris, Vin Sullivan, Joe Giella, Irv Novick, Kurt Schaffenberger, and others! Plus: Rich Morrissey on how Golden/Silver Age star writer John Broome got to the Con! Also, Michael T. Gilbert in Mr. Monster’s Comic Crypt, FCA (Fawcett Collector’s of America) section, and more! Edited by Roy Thomas.